Other Products: Cardstock-black, off-white, Distress ink-Peeled Paint, Archival ink- Orange Blossom, Garden Patina, Jet Black, Jute twine, Diamond Dust. For more tips on creating with this collection watch the tutorial at https://youtu.be/kmqAVM6ibfM. Instructions: To view a larger image of this project, click here. Card-size is 6.25” x 12.5” after scoring the card size is 6.25” x 6.25”. Pattern paper size is 6.125” x 6.125”, tear the edges and on the top left side tear the paper and fold it so that the flowers can be pasted there. Now cut two decorative arch die from Festive Holiday die from white cardstock and paste it on the right top and bottom left side with designer dries clear adhesive. Then die cut one Eyelet circle die and paste it at the centre of the card with foam tape, and then paste one designer paper cut from the circle basics die, and distress the edges. Now stamp Classic Sunflower cling stamp set with Orange Blossom ink, die cut them with coordinating die and colour them with Garden Patina at the centre of the flower and orange blossom at the edges and shape them with deluxe flower shaping tool kit. Sprinkle Redland Elements at the centre and sprinkle Diamond Dust on the edges of the flowers and create some small flowers like this. Now die cut tag from the pattern paper with the Luggage and Tag die. Fussy cut postage stamp. 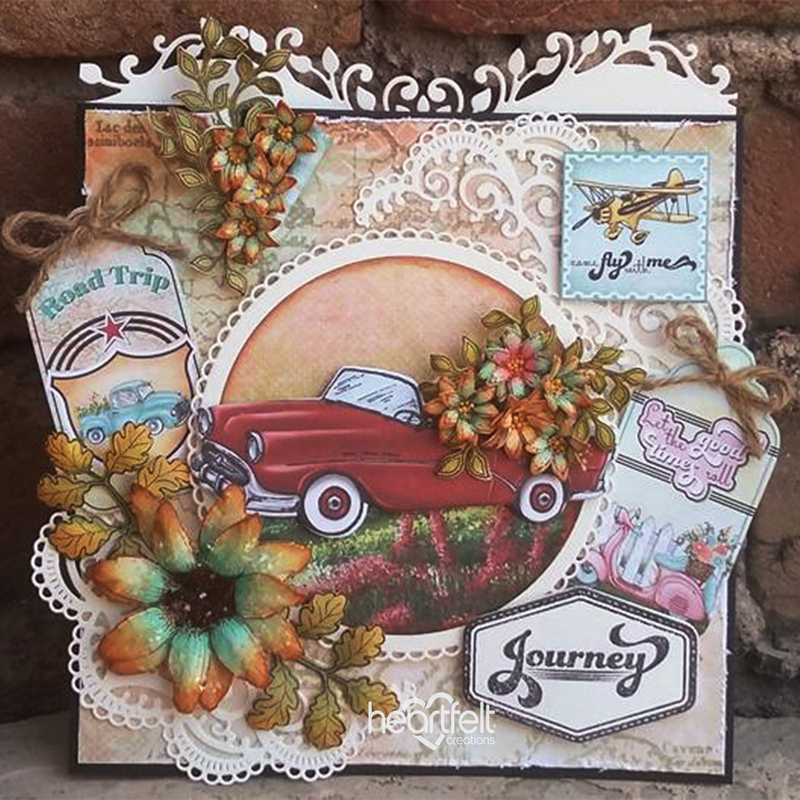 Stamp Journey sentiment with black Archival ink and die cut with the coordinating die. 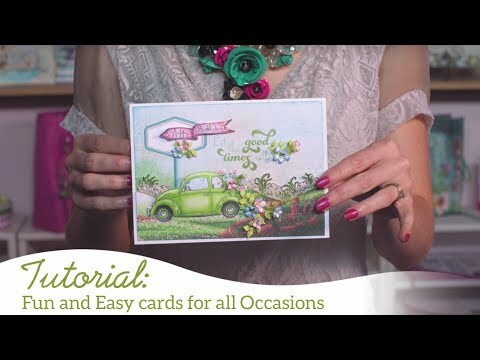 Die cut one delicate border basics die and paste it at the top of the card. Now die cut one red car from the designer paper with coordinating die and arrange the small flowers with simply classic leaves. Now arrange all the embellishments as shown on the picture.